Margaret Lawson (1895-1989) was born in Paris, the daughter of the important American landscape painter Ernest Lawson who was a member of “The Eight” along with George Luks. Ernest Lawson married his art teacher Ella Holman in 1887, and his daughter Margaret was born in Paris while he was studying there at the Acadamie Julian. 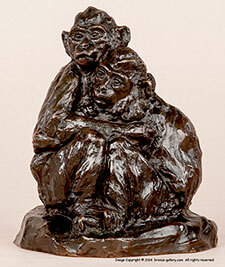 Margaret spent her early years in New York and Pennsylvania while studying sculpture. She was primarily an animal sculptor, and she won the St Gaudens prize in 1915. 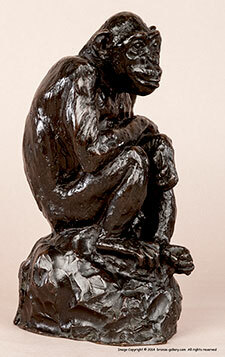 She exhibited several bronzes including the Chimpanzee Betty and the Monkeys group at the Pennsylvania Academy of Fine Arts in 1914. Margaret later lived in New York and Connecticut, she also spent time in Florida before she and her mother moved to New Mexico in the 1930s after her father’s death. She founded the Bandra Ghur Kennels in Santa Fe under her married name of Margaret L. Nison where she became influential in breeding Afghan Hounds, producing many winning dogs into the 1940s. She continued to sculpt and later married again, spending the rest of her life in Berkeley, California, where she died in 1989.